It was an easy decision for the Board of Juniata Valley Audubon Society to present our 2017 Conservation Award to the Stephen Gerhart family. 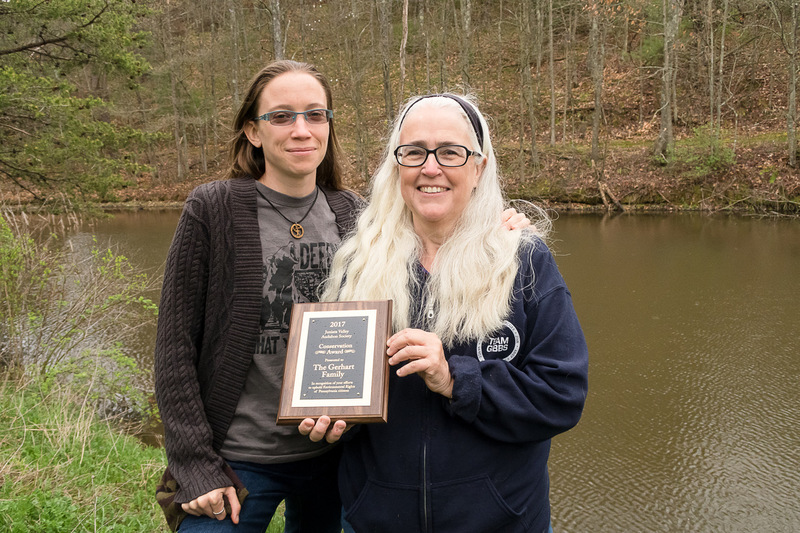 It was an easy decision for the Board of Juniata Valley Audubon Society to present our 2017 Conservation Award to the Stephen Gerhart family who live a few miles south of Huntingdon, Pennsylvania. Although the Gerharts are not Audubon members, they embody the environmental ethics that characterize many Audubon members: love of the land; conservation of bird and other wildlife habitats; and the fortitude to stand up to big corporations that destroy forests without the landowner’s permission. The Gerharts placed their 27-acre forested property in the Forest Stewardship Program about ten years ago, a Pennsylvania Department of Conservation and Natural Resources Bureau of Forestry program that helps landowners develop goals so their forest is sustainable and healthy for people and wildlife. 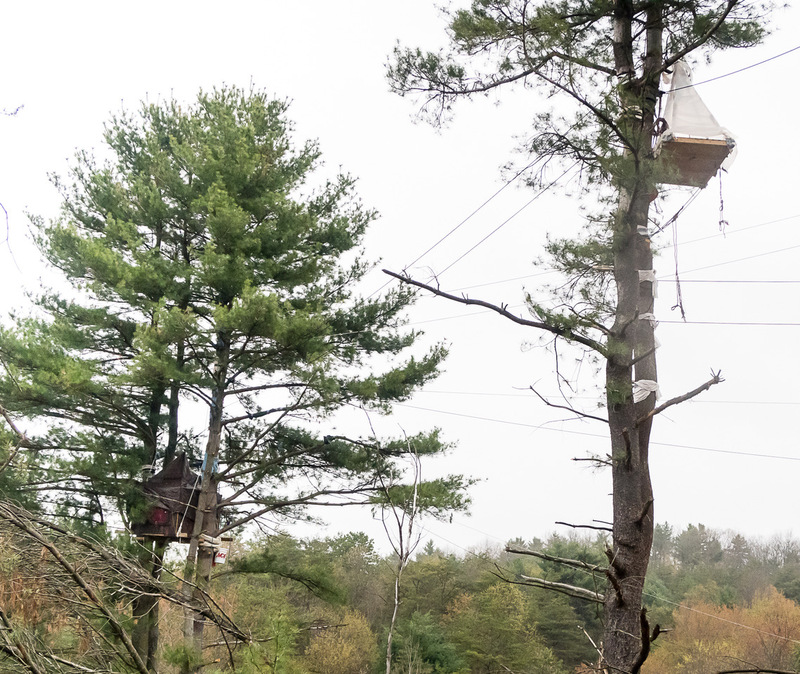 It is a program intended to create a legacy for the Gerharts — or it did until two years ago, when the Gerharts got a knock on their door from a land agent, informing them that Sunoco Logistics planned to construct the Mariner East II pipeline under their property, including under their pond and through the forested wetlands. The Gerharts refused to take the money offered by Sunoco and to this day steadfastly refuse to accept any payment. The Gerhart family is just one of hundreds of families in Pennsylvania faced with property destruction and safety concerns caused by Sunoco’s plans to construct about 306 miles of pipeline across Pennsylvania. On February 13, 2017, the Pennsylvania Department of Environmental Protection (DEP) approved the Chapter 105 and 102 pipeline permits for the project officially known as the PA Pipeline Project/Mariner East II. Almost 30,000 comments were sent to the DEP during the public participation process prior to that decision. Many of those comments were from landowners who were concerned about their family’s safety, since many miles of the pipeline will be located very close to schools and homes. According to the DEP file, the Pipeline Project will transport up to 700,000 barrels per day of natural gas liquids (propane, butane and ethane) from the Utica and Marcellus Shale formations in Ohio and western Pennsylvania for both domestic and international markets using two new pipelines that are mostly found in the existing right of way corridor for the current Mariner East pipeline system. The Project will supply propane at various exit routes across Pennsylvania and terminate in Marcus Hook, Pennsylvania where fuels will be exported for international markets. The fact that domestic markets are included allowed Sunoco to obtain eminent domain, so affected families felt hopeless, and accepted the money offered by Sunoco. 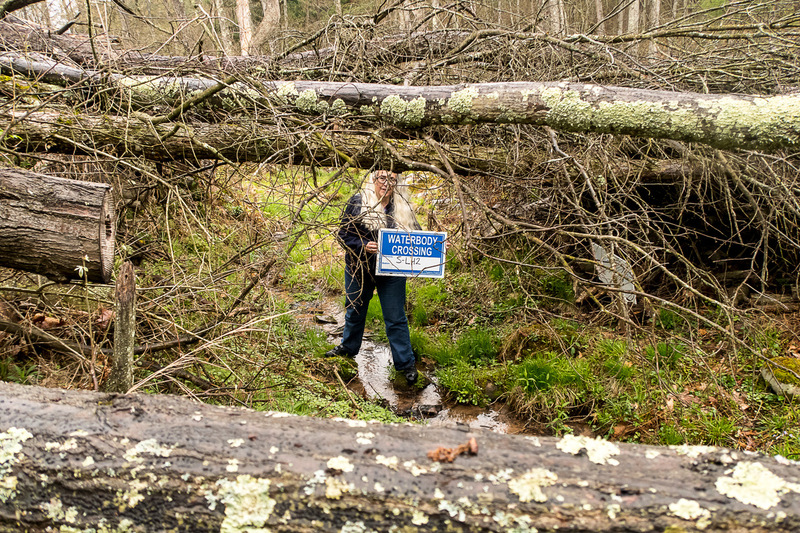 What sets the Gerharts apart from many of the affected landowners is their continued resistance — they are still saying “NO.” Using similar tactics seen in western states to protect the redwoods and sequoias, Elise sat in a tree for two weeks in 2016, while nearby trees were cut all around her. Her mother, Ellen, who was not afraid to confront the workers face to face, was arrested and jailed for three days. Elise was criminally charged later. Fortunately, the disorderly conduct and contempt of court charges were eventually dropped against Ellen, Elise, and activist Alex Lotorto. Sunoco claims the project disturbance will total 273 acres in Huntingdon County, causing extensive forest fragmentation. Although the three acres of disturbance at the Gerhart property doesn’t seem like much, it is symbolic of a greater concern: that of social injustice impacting rural families where the value of land and forests is worth far more than a few development dollars. Sunoco touts the potential for jobs and economic development opportunities, but rural landowners know that the environmental footprint of energy development grows bigger each year: pipelines, electric transmission lines, wind turbine projects, fracking wells, industrial solar projects — all of these energy-related development projects will continue to expand while open space contracts. Cities like Philadelphia plan to benefit from the pipeline project, but it is at the expense of rural forests and families. Juniata Valley Audubon Society applauds the Gerhart family for trying to protect their property from industrial development. The Juniata Valley Audubon Society 2014 Conservation Award was presented to Ron Singer, the founder of the Jacks Mountain Hawk Watch, at our Annual Banquet in April. The Juniata Valley Audubon Society 2014 Conservation Award was presented to Ron Singer, the founder of the Jacks Mountain Hawk Watch, at our Annual Banquet in April. Ron started watching migrating birds on Jacks Mountain in Mifflin Co. almost 40 years ago, before many people knew that the mountains in the ridge and valley province in Pennsylvania were critical flyways for thousands of birds. Ron's particular interest was documenting the hawks and eagles that migrate over Jacks each year. Ron is still very active today, as he is the main facilitator and compiler of the Hawk Watch. Ron organizes a fall hawk watch each year, and all data is sent to the Hawk Migration Association of North America (HMANA). You can access this data on the Jacks Mountain page at hawkcount.org. Because of his love of the mountains that surround him, Ron has helped with Mid-State Trail maintenance and he was instrumental in organizing a large-scale clean-up project along the sides of the Jacks Mountain Overlook which removed huge amount of trash that had been dumped there for decades. Ron spends innumerable hours on top of Jacks sharing his love of migrating raptors and his expert identification skills with everyone who stops during the migration season. His leadership and dedication to the Jacks Mountain Hawk Watch has also ignited a larger group of people to form known as Friends of Jacks Mountain. This new organization is a community action group that was formed because the Jacks Mountain Hawk watch is threatened by industrial wind turbine development on Jacks Mountain. The Juniata Valley Audubon Society 2014 Conservation Award honors Ron’s dedication to observing and documenting raptor migration, as well as founding and maintaining the Hawk Watch at Jacks Mountain. The Jacks Mountain Hawk Watch has a commemorative patch for sale. Email Ron Singer at risinger2@verizon.net if you would like to purchase one for $5.70, which includes shipping. The patch features a Broad-winged Hawk, since thousands of them migrate over Jacks each fall. You can learn more about the Jacks Mountain Hawk Watch at their webpage.